The image of an aged Woody Allen facing down a tribunal of stone-faced rabbis near the end of Fading Gigolo is probably a keeper, and whatever else one might say about John Turturro’s film, it deploys its septuagenarian special guest star to superb effect. 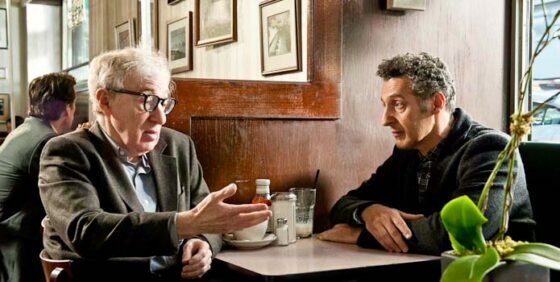 To wit: Woody here is playing the amateur pimp to Turturro’s fading gigolo, and the contrast between the two actors—one pushy and verbose, the other hulking and dumbstruck—plays out as a comic Cartesian divide. Allen’s “Dan Bongo” (his pimp nom de plume) sets ‘em up with his patter and Turturro’s “Virgil Howard” knocks ‘em down—“’em” in this case being a clientele of high-rolling, under-sexed, over-stressed older New York women. Fading Gigolo is easily recognizable as a vanity project, but it’s hard to take Turturro too much to task when he hits so many other grace notes in between blowing his own horn. Virgil’s pre-man-whore gig at a flower shop occasions some lovely shots of exotic plants in bloom, and it’s clear that Turturro is filling the frame and the soundtrack with a few of his favourite things: jazz music, sultry beauties, Williamsburg street scenes, and a whole lot of Woody. He also rings a gentler variation on the Big Apple tribalism of his other diminutive auteur buddy’s Do the Right Thing by having Virgil (whose real name is Floravante) become scandalously smitten with a Hasidic widow (Vanessa Paradis, strangely well-cast). It’s amusing that an Italian actor who has played some of moviedom’s most extreme Jewish caricatures—from Barton Fink to Herbert Stemple—has written himself a role where he’s on the outside looking in at the Chosen People.